The Magazine of the Week is the June 1937 issue of G-8 and His Battle Aces, with cover story "Flight from the Grave" by prolific pulp author Robert J. Hogan. 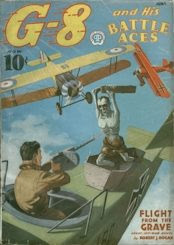 G-8 was an attempt to combine a hero pulp with a war pulp about World War I fighting aces. In order to include the amount of action and intrigue that hero pulp readers expected, G-8 resorted to some of the most bizarre story devices ever seen in the pulps or anywhere else. I love this cover image (by Frederick Blakeslee) of a vampire/zombie emerging from a coffin perched on top of a World War I biplane. Did he nail that thing to the fuselage the night before? Of all the absurd magazine covers that appeared in the pulp era, this one gets my vote as the most outrageous. 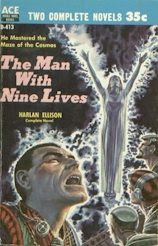 G-8 is remembered fondly by science fiction collectors for its wild elements of fantasy and horror. Many other hero pulps also had elements of science fiction and fantasy, particularly Doc Savage and The Secret 6, but there was only one hero pulp that was actually set in the future. You will see this futuristic hero in next week's Magazine of the Week. Many incorrectly believe that the character of The Shadow was introduced in the radio show, narrated by Orson Welles and others, with the famous tag line, "Who knows what evil lurks in the hearts of men? The Shadow knows!" The Shadow did first appear on radio, but only as a voice introducing the show Detective Stories. None of that show's stories were about The Shadow. Nevertheless, fans of Detective Stories were intrigued by the mysterious narrator, so Street & Smith decided to turn The Shadow into an independent character, which they did in the pages of The Shadow magazine, beginning in 1931. 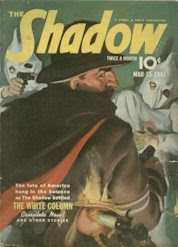 Most of the contents of The Shadow magazine were written by Walter B. Gibson, under the pseudonym Maxwell Grant. 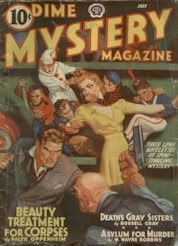 The success of the magazine then inspired the famous Shadow radio show, which premiered in 1937. In addition to the radio show, The Shadow magazine also triggered an entire genre of "hero pulps." 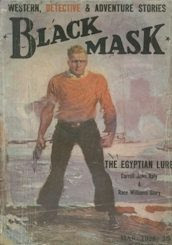 Some of these hero pulps, notably Doc Savage, The Spider, and The Phantom Detective, enjoyed years of success, but none ever quite equaled the popularity of The Shadow. When many pulp genres later made the transition to paperbacks, the hero pulps instead transformed into a genre of comic books. Comic books then gifted most of their heroes with superpowers. The pulp heroes were instead mostly Batman-style heroes, relying on their wits and cleverness and some cool gizmos. The Shadow of the magazines did not even have his mysterious ability to cloud men's minds so they wouldn't see him--in the pulps he was just real good at skulking in corners. The Shadow was given his psychic powers by radio producers, who didn't think "and then I hid under the table" was dramatic enough for radio. 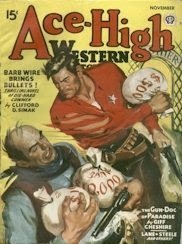 Some of the hero pulps attempted to integrate the hero genre with other pulp genres. My favorite example will be next week's Magazine of the Week, a hero pulp that was also a war pulp that was also a Weird Tales imitator. The Magazine of the Week is the August-September 1953 issue of Fantastic Universe, with cover art by Alex Schomburg. Here we see the image of the Statue of Liberty buried in the sand, to belabor my point that Hollywood sci-fi has never (save once) come up with anything written science fiction didn't already cover decades earlier. By the way, this isn't meant as a slam on the 1968 version of Planet of the Apes, which I consider an underrated film. People have focused on the monkey make-up and terrible sequels and forgotten that the original movie actually had something interesting to say. The remake is another matter. Fantastic Universe was one of a host of digest-sized science fiction magazines to hit the market in the 1950's. The digest magazines dashed in to fill the void as the pulp magazines disappeared. By the late 1950's, the pulps were entirely gone from the newsstand, and the few science fiction pulps to survive managed it only by switching to digest format. The digests operated on shoestring budgets, yet managed to offer some of the best writing around. 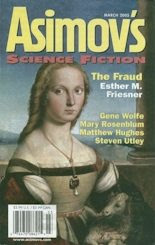 The Magazine of the Week features such outstanding authors as Evan Hunter (who became famous for his mysteries under the name Ed McBain), Richard Matheson (later a very successful screenwriter), and SF luminaries Poul Anderson, Clifford Simak, Eric Frank Russell, and Andre Norton (under her pseudonym Andrew North). We'll return to some of the digest magazines in future BOTWs, but first let's get back to our history of the pulp magazines, with the most successful title in the "hero pulp" genre. 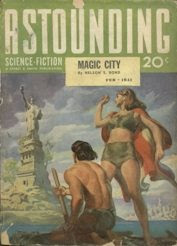 Continuing our tribute to pulp writer Nelson S. Bond (1908-2006), the Magazine of the Week is the February 1941 issue of Astounding Science Fiction, with Nelson Bond cover story "Magic City." 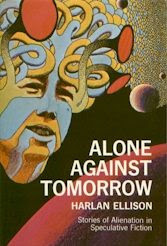 That Bond is the sole author mentioned on the cover shows how highly he was regarded during the pulp era, for this magazine also contains stories by science fiction legends Robert A. Heinlein (one story under his real name and a serialized novel under his pseudonym Anson MacDonald), Theodore Sturgeon, and L. Sprague de Camp. This issue also has a great cover by Hubert Rogers. The film Planet of the Apes (1968), starring Charlton Heston, effectively used the image of a ruined Statue of Liberty to symbolize lost hope in a post-apocalyptic future. But with only one important exception Hollywood science fiction has always been decades behind written science fiction, and so we see that the ruined Lady Liberty concept originated not with Hollywood but with Nelson Bond's story "Magic City." ("Magic City" also takes the reader into the derelict New York subway tunnels, anticipating the best of the film sequels, Beneath the Planet of the Apes.) 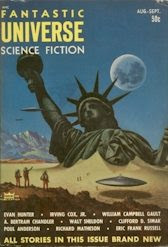 No need to speculate whether Pierre Boulle, author of the novel on which Planet of the Apes was based, ever saw this magazine growing up in France, for Boulle's novel doesn't contain the Statue of Liberty scene at all -- the novel's twist ending is closer to the ending of Tim Burton's 2001 remake. And just in case anyone wants to give Hollywood credit for adding power to the image by burying the Statue of Liberty in the sand, we'll dispel that notion with next week's Magazine of the Week. 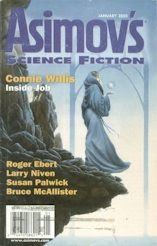 The March 2006 issue of Asimov's Science Fiction contains four novelettes and three short stories. My initial plan was to read the January 2006 issue, but I couldn't locate that magazine at first. The colorful cover of the March issue caught my eye. 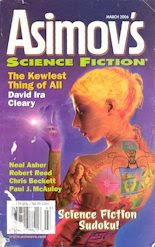 The artwork is by J.K. Potter for the novelette "The Kewlest Thing of All" by David Ira Cleary. This futuristic story features a girl that has a videophone embedded in her palm and browser windows across her skin. She is guerilla marketing "kewlness" to a chubby woman technician. The setting is San Francisco flooded by melt water (global warming). It reads like updated cyberpunk. The ending confounded me somewhat, but I'd recommend this story. "The Gabble" by Neal Asher is a standout SF novelette set on another world. Scientists on the alien world of Masada study its unusual lifeforms, including the highly dangerous hooders and the frustratingly untranslatable gabbleducks. Other novelettes are "Dark Eden" by Chris Beckett which is a somewhat humorous but clichéd space adventure, and "Dead Men Walking" by Paul J. McAuley which is set on Uranus’s moon of Ariel and has a dying man telling of his search for a gory assassin. Short story "46 Directions, None of Them North" by Deborah Coates is a fun, slangy, story told by a sixteen-year old girl who has to go to Alaska to see aliens land. "Companion to Owls" by Chris Roberson is a odd fantasy of a man's mostly solitary life on the Roof of a Cathedral that covers thousands of square miles. Last, but not least, is the powerful short story "Rwanda" by Robert Reed which deals with a cheap colonization of Earth, the enormousness of such an event, and how inhumanely humans can act to one another. 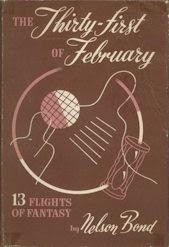 The Book of the Week is The Thirty-First of February, a collection of short fiction by Nelson S. Bond. This is to honor Mr. Bond, who passed away recently at the age of 97. 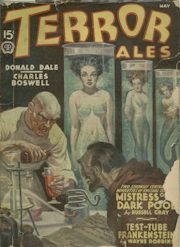 Nelson S. Bond was a prolific pulp writer, penning well over 200 stories for the pulp magazines. He is best remembered for his light-hearted science fiction and fantasy for the SF pulps and for Blue Book and Weird Tales, but he also wrote many stories for the sports and mystery pulps. 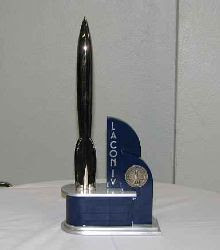 Most of his work was first published between the late 1930's and the mid-1950's, and he only occasionally wrote fiction after that, including a story for Asimov's Science Fiction in 1999. He often wrote scripts for radio and television, and in 1946 wrote arguably the first teleplay ever aired on a TV network (a network consisting of New York, Boston, and Washington). 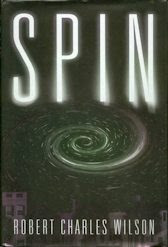 In 1998 Bond was named Author Emeritus by the Science Fiction and Fantasy Writers of America. After retiring from writing full-time, Nelson Bond went into business as a rare book dealer, so I thought it would be fitting to honor him with the hardcover first edition of one of his own books. On the other hand, we shouldn't neglect his background in the pulps. Next week's Magazine of the Week will be a pulp magazine with a cover story by Nelson S. Bond and a cover image that may have inspired the creators of the film Planet of the Apes. I thought this magazine would be a fitting one to honor Jack Williamson, not only because I love the cover's science fictional variation on the story of Noah's Ark (even if it is not quite so garish a cover as last week's), but because the magazine contains a profile of Jack Williamson in which he boasts of recently passing one million words published in his career. There is no telling how many millions more words he wrote between then and his most recent novel, The Stonehenge Gate (2005). From 1928 on, Jack Williamson was one of the regulars of the science fiction pulps until the market shifted to paperbacks. It is remarkable that he was then able to reinvent himself as a more sophisticated writer and continue his career for another half-century. Next week we will honor another mainstay of the science fiction pulps who recently passed away, a writer who was not inclined to make that transition after the pulp magazines disappeared and had written only sparingly since the 1950's. 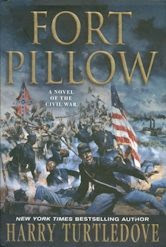 For some time I’ve been saying I wanted to read more short fiction. Years ago I used to regularly read the stories in Asimov’s Science Fiction, Fantasy & Science Fiction, and more; but not lately. I still subscribe a number of SF magazines. 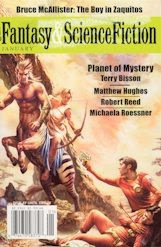 The cover story for the January 2006 issue of Fantasy & Science Fiction is "Planet of Mystery" by Terry Bisson, a pulp fiction planetary romance. The cover art is by Max Bertolini. In "Planet of Mystery" a space mission to the planet Venus improbably discovers a cool surface and breathable air on Venus, plus amazon women riding centaurs. Later a sentient robot and a flying saucer are encountered. It’s frequently ridiculous, lightweight entertainment. Sort of dumb fun. 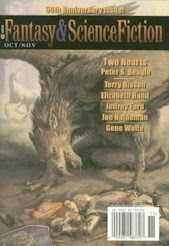 The second half of this novella is in the February 2006 F&SF issue. The magazine contains two novelettes, both of which were good. "Less than Nothing" by Robert Reed is part of a series of stories about Native American boy Raven. This is fantasy intersecting with today's world. "The Boy in Zaquitos" by Bruce McAllister concerns a CIA operative secretly spreading plague in South America in the 1960s. It read as scarily too real. Of the four short stories, my favorite was "Horse-Year Women" by Michaela Roessner. It’s an emotional modern story entwined with tales of women born in the Oriental Year of the Horse. My least favorite story was the "Shadow Man" by Matthew Hughes due to its creepy horror elements. "A Daze in the Life" by Tony Sarowitz is a near future science fiction story about hiring out brain processing power. In fairy tale "Journey to Gantica" by Matthew Corradi a woman grows as tall as a giant and shrinks to miniature size. The Book of the Week is The Green Girl by Jack Williamson, who passed away Friday at the age of 98. Jack Williamson made a great many contributions to the world of science fiction and fantasy, including such classics as Darker Than You Think and The Humanoids. 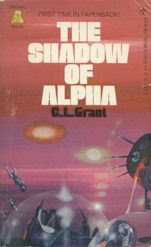 He coined the term "terraforming" and wrote the first stories involving the modern concepts of androids and anti-matter (which he called "contraterrene" or "C-T" matter). But Williamson will probably forever be best remembered for the incredible longevity of his career. 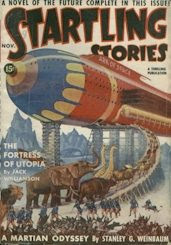 Jack Williamson sold his first story in 1928 and was an established author with dozens of published works to his credit before Isaac Asimov and Robert A. Heinlein even made their first sales. (Isaac Asimov was thrilled to receive a congratulatory post card from Williamson after Asimov's first story was published.) Yet he continued to write impressive and important fiction into the 21st Century, publishing works in nine different decades. He won the Hugo and Nebula Awards for Best Novella for his story "The Ultimate Earth," published in 2000, 72 years after his first story. Williamson held a PhD in English literature from the University of Colorado and taught full-time at Eastern New Mexico University from 1960 to 1977. After that, he taught part-time and organized the Jack Williamson Lectureship Series, an annual program inspiring a new generation of writers since 1977. 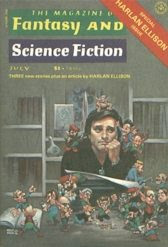 Jack Williamson was the second person ever named "Grand Master" by the Science Fiction Writers of America (Heinlein was the first). He was also named Grand Master by the World Horror Society, received the World Fantasy Award for life achievement, and has been inducted into the Science Fiction Hall of Fame. 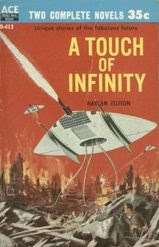 As you can see from the Book of the Week, Avon Fantasy Novel #2 printed in 1950, Jack Williamson was one of the authors who helped science fiction and fantasy break into the new paperback fiction market. He was already very familiar to SF readers at the time thanks to his pulp fiction, an example of which we will see next week. 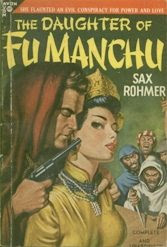 We can hardly discuss the "yellow peril" subgenre without mentioning the most successful yellow peril writer of all, Sax Rohmer, and his most famous character, Fu Manchu. The Book of the Week is The Daughter of Fu Manchu, the first American appearance of Fu Manchu in paperback. 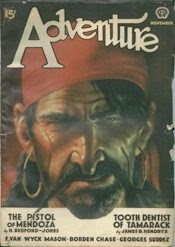 As we have seen the past two weeks, any history of the pulp magazines must acknowledge the unfortunate racial stereotypes that were prevalent in the pulps. However, there were also occasions when the pulp magazines actively attempted to change prejudiced attitudes in society. Next in our tour of the pulp magazines is an issue of the most successful of the "hero pulp" magazines, in which our hero battles racial prejudice . . . with a pistol. But first, next week we will honor a recently departed pulp writer. The Magazine of the Week is the July 1934 issue of Adventure magazine, cover art by Walther M. Baumhofer. One aspect of collecting pulp magazines that takes some getting used to is that often the magazines' covers and contents reflect the prejudices of the time. The cover of the Magazine of the Week, featuring a sinister-looking Asian villain (check out his sharpened thumbnail), is an example of what collectors call "yellow peril" cover art, a common racial stereotype in the pulp era. 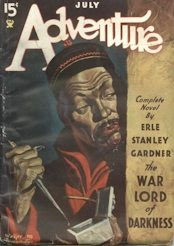 The Magazine of the Week's "yellow peril" cover illustrates the story "War Lord of Darkness" by Erle Stanley Gardner. 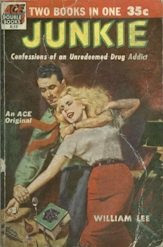 This was published one year after Gardner created the character for which his is now best remembered, Perry Mason. At the same time, while politically correct attitudes can be taken to excess, this kind of cover art is a reminder of the important function served by what we now call "political correctness." 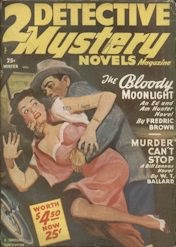 By perpetuating racial stereotypes, the pulp magazines contributed to bigoted attitudes, helping to make possible for example the internment of Japanese-Americans during World War II. Stereotypes about Asians and African-Americans were especially common in pulp fiction, and the fact that social norms have evolved to the point that such attitudes are no longer tolerated in the publishing field is something to be celebrated. I hope you will forgive me for circulating this cover image, but I think it is a useful exercise to look back upon the attitudes of the past, so that we may see how far our society has come and remind ourselves not to repeat past mistakes.